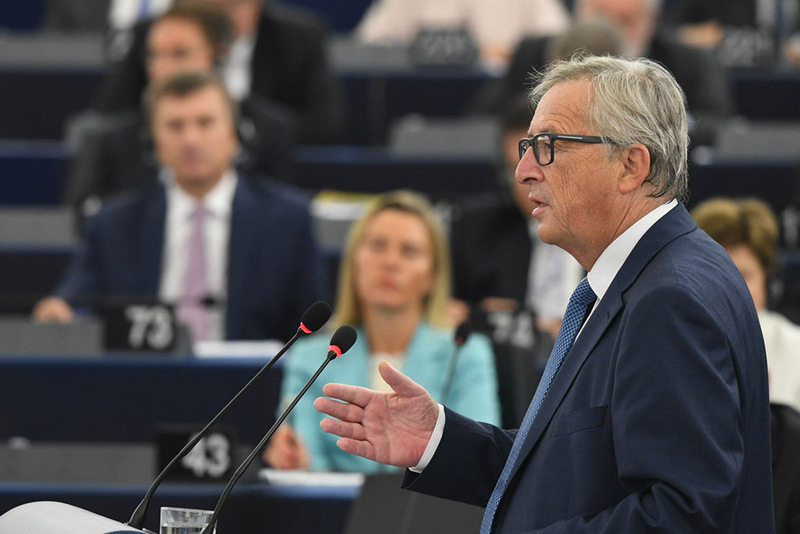 Populism, unemployment and social injustice are among the key challenges for the EU, said Commission President Juncker in his annual State of the Union speech in the EP on Wednesday. The refugee crisis, Brexit and counter-terrorism were also debated with political groups’ leaders and other MEPs, who put forward their visions of how to address people’s deepest concerns about the future. EP President Martin Schulz, before giving the floor to Commission President Jean-Claude JUNCKER, said that the State of the Union speech is a very important moment in Parliament’s work, especially in times where we might be witnessing a fundamental change and just two days before the Bratislava summit. European Commission President Jean-Claude JUNCKER started his speech by naming the biggest challenges EU is facing now: fragmentation, populism, unemployment and social injustice. “Populism does not solve problems, but creates them”, he stressed. Turning to Brexit, he said “We respect and regret the UK decision, but EU as such is not at risk. “ We would be happy for the request for Brexit to take effect as soon as possible.” He also noted that the new relations with UK will not include “à la carte” access to the single market. Mr Juncker also touched on other challenges that Europe needs to tackle: swiftly ratifying the climate change agreement, further free trade agreements with third countries such as CETA, data protection, fighting tax evasion, building capital union, access to high speed internet and more job-creating investment. He also announced that the amount of European strategic investment fund would be doubled. On the refugee crisis he said: “we have started to see solidarity but much more is needed.” He proposed creating an EU solidarity corps and a new investment plan for Africa. On counter-terrorism, he stressed the need to step up information exchange among national police authorities and proposed, inter alia, strengthening Europol. And he announced a proposal for a European Defence Fund. S&D group leader Gianni PITTELLA (IT) thanked Mr Juncker for his positive responses to his group’s proposals on sustainable growth, the investment plan, jobs and the fight against tax evasion. Mr Juncker’s speech had been “aware and responsible”, he said, welcoming flexibility and the lack of references to austerity. On Brexit, Mr Pittella noted that UK Prime Minister Theresa May had kept the EU “in a stalemate” for the three months since the Brexit vote, and stressed the need for the EU to respond. ALDE group leader Guy VERHOFSTADT (BE) said there is a split between generations on Europe, with the younger in favour and the older more sceptical. “Populists preach a false sense of security, that with walls and fences we solve all the problems, but how do you keep climate change or terrorists out of your country? With fences or with European policies?”, he asked, adding that “Europe is the cure for the cancer of nationalism” and that Brexit is an opportunity for Europe. “It is always the shoulders of citizens that carry the debts”, said Gabriele ZIMMER (GUE/NGL, DE). “We keep talking about flexibility and jobs, but how are citizens going to believe it?” she asked, saying that priority should go to ensuring that the citizens of Europe have “proper jobs and proper places to live”. Ms Zimmer also said that the EU has to be made more democratic. Rebecca HARMS (Greens/EFA, Germany) stressed that the EU is an answer in uncertain times of globalisation and called for new actions that could give citizens “new trust in a new common European path”. She also called for a climate union and for swift ratification of Paris climate agreement. EFDD leader Nigel FARAGE (UK) reiterated that he was pleased by the UK vote to leave. He predicted rapid growth in opposition parties in Europe, saying that “you are not going to stop Eastern European countries saying no to Merkel’s refugee policy”, and that there would be more referendums on Europe. Marine LE PEN (ENF, FR) called Mr Juncker’s speech “insipid and faulty”, saying that it was “basically like a funeral for the EU”. For Ms Le Pen, “Brexit has really broken a taboo, it has showed that one can leave the EU and come out better.” Replying to a question, she said she would propose a referendum on Frexit if elected President of France in 2017. Diane DODDS, a non-attached member from the UK, hoped that after Brexit “EU and UK will define and build new and mutually beneficial relations”. The EU is facing unprecedented challenges, but first and foremost must fight uncertainty, stressed Ivan Korčok, State Secretary of the Slovak Ministry of Foreign and European Affairs. The Bratislava summit of 16 September will be "an opportunity for a frank and open discussion" in the aftermath of the UK referendum and "will kick off a process" of finding "common ground" in "migration, internal and external security", he said. EC President Juncker, in his reply to MEPs’ interventions, explained that intense negotiations are ongoing with Turkey on visa liberalisation, but that all preconditions need to be fulfilled. The laws on terrorism for example have to be changed. As for the social pillar, the Commission is putting out consultations for the time being. The video recordings of each speaker’s interventions are available here.